- The Australian Cattle Dog - is part of the working dogs group of dog breeds and has a similar build and look to the wild Dingo, it's also known as the Hall's Heeler, Queensland Heeler, ACD and the Australischer Treibhund. Due to the dog's habit of nipping the heels of cattle when manoeuvring them it became known as the Australian Heeler or Blue Heeler, the breed was initially developed by involving crossings between the Dingo's, Sheepdogs, old smooth Collies, Dingo-Blue Merle Collies, Dalmatians, Black and Tan Kelpies and Bulldogs which in-time (around 1890's) the breed became fairly pure and recognised by Robert Kaleski which documented a standard for the breed and the result was a breed of excellent working dogs that were able of herding cattle on large scale ranches and farms working stock quietly yet forcefully droving the cattle across very long and wide distances under extremely hot and dusty conditions being able to track and take control resetting the orientation of even the most stubborn cows. The Australian Heeler is tireless and capable of fast movements, has incredible stamina and is able to work all day long. This breed is quite wary of strangers but is loyal and easy to tame and therefore can be kept as a pet as long as plenty of regular exercise is given. 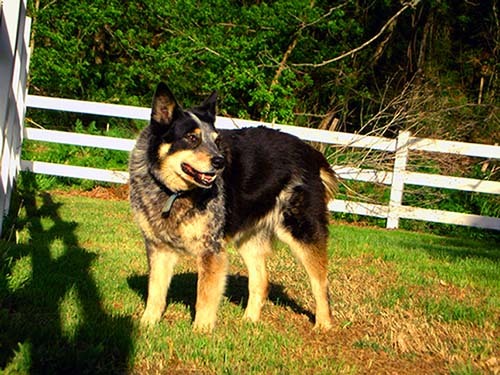 - Click here to know even more about the Australian Cattle Dog Breed.